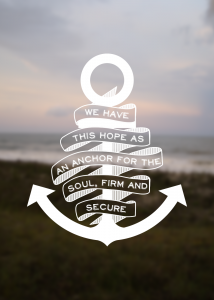 This past week my thoughts kept going back to the Lord is my anchor, the Lord is my anchor. I heard this several times in my heart. Then I get to church today and my pastor sermon topic is, if your soul isn’t anchored in Jesus, you will surely drift away. I think God is trying to tell mt something. I’m going through some things, and it’s a little rough but I know God has my back. And if God doesn’t show up when I think He should, it’s okay because I’m anchored in Jesus. His faithfulness always holds strong. I’m praying I stay strong in Him. Sometimes, you have to step out on faith, trust God and all His wonderful, awesomeness to get you where you need to be. I’m a ship without a sail, but He is my anchor. Share your testimony about how God has held you down.